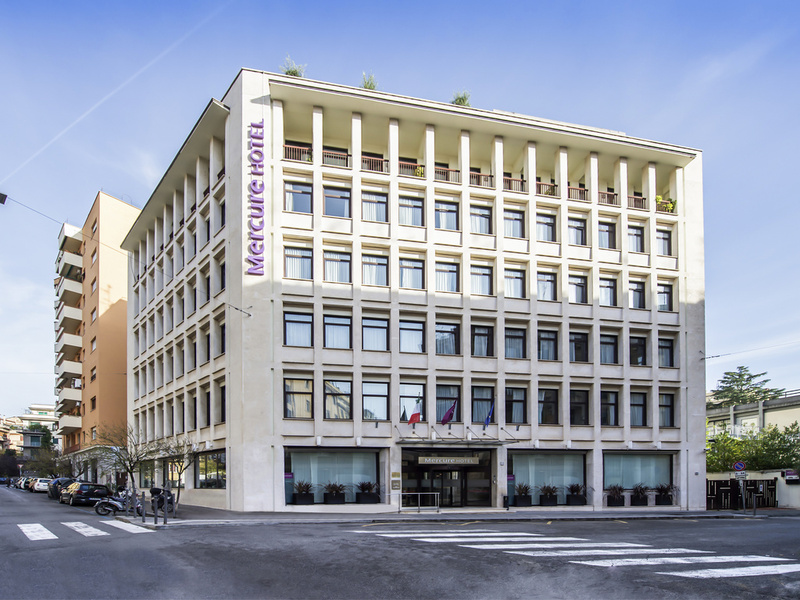 The Hotel Mercure Roma Piazza Bologna is a modern, welcoming hotel in Rome Tiburtina. With its strategic position in an elegant, central part of the city, just a few minutes' walk away from the metro, this hotel in central Rome boasts all modern comforts and ensures fast connections with the main landmarks such as Piazza Venezia, St. Peter's Basilica and the Vatican Museums. In an area full of restaurants, bars and shops, it is the ideal location for your business trip or vacation. An ideal location thanks to the nearby Bologna metro stop, from which it is easy to reach the historic center of Rome, the Colosseum, the Imperial Fora, Trajan's Market, the Trevi Fountain and Piazza di Spagna. 97 rooms over 7 floors, 5 of which are non-smoking, soundproofed, wood floors, air conditioning, LCD TV with international channels, Sky Movies and Sky Calcio (soccer), free WIFI, minibar, tea and coffee making facilities. Enjoy snacks and cocktails in the cozy atmosphere of our "Le Ville" bar. Internet point and plasma TV. Overall, It was good. Quite and clean room. Staff was excellent and very helpful. Had a nice stay but no air conditioners in operation. We were told that this time of the year air conditioners are switched off. Had a warm and sleepless nights. In fact all our other Accor Hotel properties were the same in Italy. It is better at least you announce this fact in your website not to surprise overseas guests. What I liked most was the laid back atmosphere in the hotel. Everything was well taken care of. I enjoyed the breakfast. The room was nice. Airconditioning and the windows could be opened. During the night it was quiet. 3 rooms for 3 nights ! Staff was kind and helpfull but the hotel is clearly not at accord standard for a mercure nor a 3 star hotel (noisy rooms, small, dirty shower, tapes use for paint still there, electric counter making noise, bad sound proofing, bathroom door not closing) that is why we changed room 3 times !! Extremely enjoyable stay with excellent service. From the moment we arrived at the hotel, Sylvia made us feel very welcome. Our room was comfortable and quiet. The staff at the reception, breakfast room and bar were all both helpful and friendly and they made our stay very memorable. Well located for transport to city and airport. 5 mins walk to Bologna metro which is 3 stops from Termini or 1 stop from Tiburtina for Fiumicino airport. Surrounding area has many pizzerias, restaurants and convenience stores and we felt perfectly safe wandering around late at night. We had 3 rooms for 2 nights, all were very clean and comfortable - no problems with any of the facilities. Breakfasts were good with a decent variety of hot and cold food. I will be booking this hotel again when I next visit Rome. Thanks to the staff for a very enjoyable stay. Enjoyed the comfort of your hotel very much, lovely room and great breakfast. Ideal location, great staff from the reception and service, comfortable rooms. we stayed here for five days. the location is the property's edge plus the very professional staff at the reception (thank you for the recommending il tunnel restaurant, we had dinner here four times) and the breakfast team. room was quiet, modern and comfortable. I have stayed in this hotel several times and have always found it a pleasure to be there. The rooms are comfortable, there is a kettle which is always important to the English and the staff are very helpful. It is close to my friend who lives nearby and the public transport system is excellent from the hotel. The room service was very expensive and not of good quality. The only pizza on the menu, wasn’t a pizza but a folded sandwich. That’s a pity for being in Italy! Good breakfast, nice staff, nice room, in a nice neighbourhood. Plenty of nice local restaurants where the locals eat which were good value. The hotel was in a good location, near a metro station. Nice room, comfy bed, and spacious bathroom. The bar was nice. I would like to thank all the staff of the hotel about their professionalism and kindness. The room was very clean and the breakfast had plenty of food with a wide variety. Any information I asked from the desk staff was answered with intelligible manner.